It’s the year 2017 and we live and breathe quotes. Go ahead, think about it… I’m sure you have one or two tumbling around in your head, something that you constantly throw out and use as a reason to do something or to not do something. It’s simple, straight to the point and always makes me just go for it. Although sometimes… It’s caused a lot of problems and this has led me on a hunt for a new life moto or quote to live by! But enough about me, let’s focus on YOU. If you don’t already have a quote to live by (or if you’re looking for a new one like me), then maybe one of these is for you? And to switch it up a bit, I’ve looked for quotes by great and wonderful drivers (real and fictional) because hey, life is a highway and I’m betting they knew a thing or two on how to navigate it! Who is he? Nicknamed El Maestro, he’s the man who dominated the first decade of Formula One, winning not one, not two but five championships! A feat that has been matched and beaten only by Michael Schumacher. Also, he was once kidnapped and after his release, he stayed friends with one of his captors. Oh yeah, he had stories to tell. This five time champion only achieved this because of his passion for racing. Just goes to show – if you’ve got passion then you’re almost there! How can we talk about drivers and not bring in Fast and Furious? Now there are many quotes to live by from these infamous drivers (WE RIDE TOGETHER, WE DIE TOGETHER!) but Brian’s words here really resonate with what life is all about – we can hardly ever plan for anything – life happens whenever and however it wants to and all we can do is face it head on. Most of the time, we’re planning things on the fly – we improvise. So adopting this quote is fitting, I think. Who doesn’t know Lewis Hamilton; an F1 champion and someone who’s often regarded as his generation’s best driver. This quote by him is different from the others, it’s got personality and attitude. It also gives you a gameplay for life – Be a panther. When there’s competition (or a struggle), don’t cower and don’t try for a sneak attack from behind. Instead, let everyone know you’re coming, look them in the eye and destroy what’s in your way! The next time you’re faced with a problem, be a panther and announce to the world that you’re gonna face it head on and you’re gonna do whatever it takes to take it down. Alright, so this one might be a cop out but I think it qualifies nonetheless. 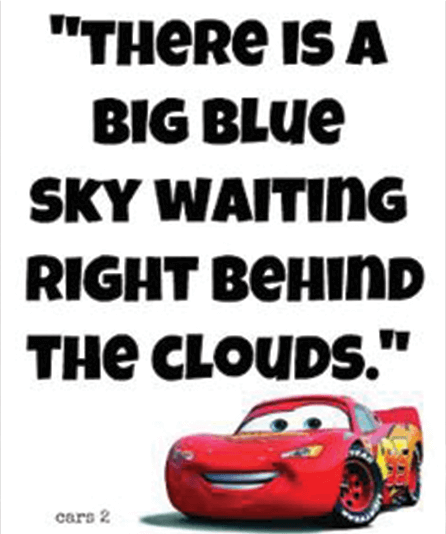 Lightening McQueen taught us many things (Ka Chow!) but one of the most important ones is that there is always light at the end of the tunnel. Hope is a beautiful thing and knowing that without a doubt, there is something better waiting for you – well, it’s a powerful motivator and a perfect quote to live by. Especially nowadays, what with our feeds bombarded with catastrophe after catastrophe. So if you find yourself on the floor, pick yourself up and dust yourself off because there’s good out there. You just need to believe. Another F1 legend, this champion is someone Lewis Hamilton looked up to. His quote is powerful and well… Exciting. He definitely lived life on the edge and if you’re looking for that extra push, these words might do it if you just whisper them enough times! Interestingly, FEAR can be an acronym for Face Everything And Rise. I’m sure Ayrton didn’t think of this exactly but the message is obvious – when you’re scared, it probably means you’re out of your comfort zone. And when you’re out of that circle, you’re already halfway to everything you want. Exciting, isn’t it? Why do we name our cars?